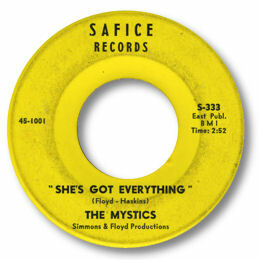 She’s Got Everything was the first- and certainly one of the rarest – 45s issued on Al Bell’s Safice label out of Washington, DC. Writers/producers Eddie Floyd and Chester Simmons had recently left the Falcons and Moonglows respectively and their doo wop/R & B heritage is evident on this splendid ballad. The hoarse lead is very effective, particularly on the spoken bridge, over a plodding rhythm section. Could Mssrs Floyd and Simmons be on this disc in the background somewhere? Intriguing.